When representatives from Cabot known as “landmen” began visiting homes in the Dimock area, offering to pay an upfront fee plus possible future royalties in exchange for access to minerals, it seemed like a great deal. With energy prices high and dairy prices low, the town’s farmers were struggling; and many residents of Dimock were stretching to pay their property taxes and mortgages. 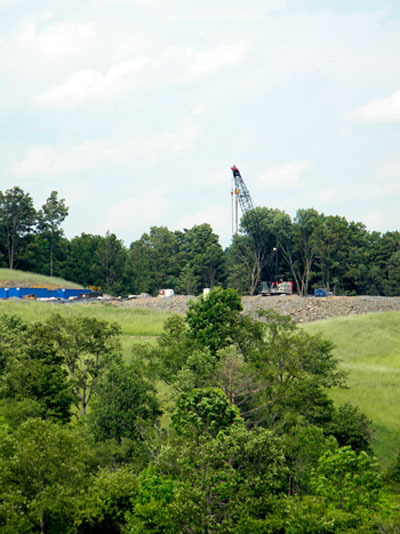 The revenue that natural gas drilling promised to bring to the area seemed to be a blessing. And for many people, it has been just that. At the end of 2009, Cabot’s wells were producing at a rate that would earn the company more than $56 million annually, according to its annual report; as a result, millions of dollars have poured into the Dimock area. Another landowner who said he has had a good experience with leasing is Mike DePaolo. According to DePaolo, he has not been negatively impacted much by the wells on his property. They have created minor annoyances such as traffic around his driveway, dust, and noise that he says doesn’t bother him much, and he does not have as much field space to cultivate hay as before. However, he said, the positives outweigh the negatives. “It looks like we’re going to need gas more with all these oil drilling problems [in the Gulf of Mexico],” he said. “And with the coal—they want to get rid of coal—it looks like it’ll be a good thing that they’re pulling this gas out.” The positives for him personally are tangible. “The money won’t hurt either,” he said, noting that it had already helped in paying medical bills, and for a new windmill in his yard. (He also said that Cabot has agreed to reimburse him for the hay he now has to buy.) “I want to be able to leave my grandkids…I’d love to be able to leave them something behind,” DePaolo said. He was hopeful that the income from the gas royalties would enable him to do so. The Elk Lake school district, whose campus is located just over ten miles from Dimock’s main intersection, has used gas leasing as an opportunity to boost its operating budget and ease the property tax burden for residents of the district. In early 2008, the district leased 170 acres of land for $750 per acre, royalties of 12.5 percent, and 200,000 cubic feet of gas per year. On June 28, 2010, Elk Lake received its first royalty check from the leases, netting the district $246,688.41 for four months of drilling on one unit and two months on another. According to The Rocket-Courier newspaper, the check came in the same day the district’s budget was to be approved, and the new source of revenue prevented the district from having to raise property taxes. Taxes actually decreased by a small amount. Because local technical colleges have only recently begun training people for the types of skilled labor needed at drilling rigs, much of the well construction work so far has been done by workers from out of the area; for instance, residents comment that they constantly see license plates from places like Texas and Oklahoma. This influx of newcomers has booked hotels full and caused rent prices to skyrocket, raising income for hotel owners and renters (although, admittedly, causing problems for other people trying to rent). The out-of-towners bring money into the local economy through their patronage of local stores, restaurants, and businesses. People have also made money driving food trucks around to well sites and selling barbecue chicken and other homemade meals to the rig workers.